A founding member of Jefferson Airplane made his final departure today. I was a high school junior when Somebody to Love and White Rabbit hit the airwaves. My band, the No Left Turns, never learned either song, probably because we harbored some deep-seated machismo over whether a guy could/should sing a tune sung by a girl. This, in spite of the fact we once tried learning Stop! In the Name of Love by the Supremes. We gave up on that one and likely swore off any further attempt to learn “girl group” songs. That was mistake number one. In the meantime, our rivals, the Jaywalkers, did a fine job on White Rabbit which made me quite envious. Their drummer sang it, a guy whose voice could reach notes several steps higher than mine. Jefferson Airplane’s songs stuck with me through college. Some of their music, particularly their Volunteers album, was an inspiration to those of us who openly opposed the Vietnam War and the wholesale conscription of friends my age to fight it. Guess I was just one of those “effete college snobs” referred to by Spiro Agnew. I had two chances to hear Jefferson Airplane perform in concert. The first was practically in my backyard at Beloit College in July 1967. My excuse for missing it? I have none that I can recall. It was a Sunday night show. What could I possibly have been doing otherwise on a Sunday night in Beloit? That was mistake number two. The next time I had an opportunity to hear the Airplane live was sometime in the fog of my senior year in college when I thought better of joining a carload of friends planning a roadtrip to another state to see them. I use the term “planning” quite loosely here. I’d already experienced one of those loosely planned roadtrips to a rock festival in Wisconsin prior to that. So I had firsthand knowledge coupled with some practical experience concerning such roadtrips. I declined this invitation. Mistake number three? Perhaps. It ends up that I never saw one of my favorite bands in concert. Just a couple of years ago I discovered my Jefferson Airplane vinyl albums were no longer playable. I replaced them with iTunes downloads and still listen to them to this day. In fact, I’m listening to Crown of Creation right now. Bon voyage, Paul Kantner. I hope you reached your final destination peacefully. 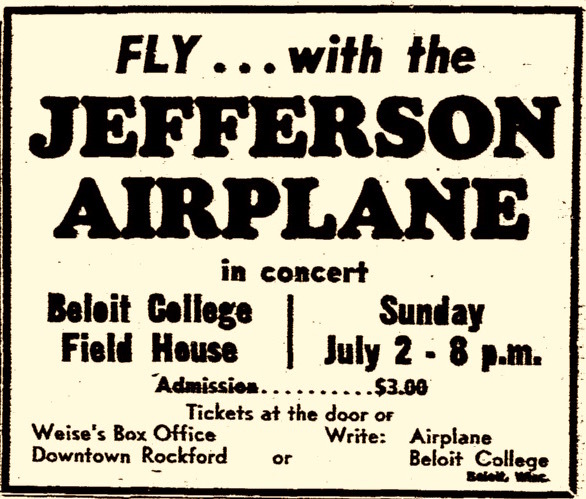 I was at the JA July 2nd concert at the Beloit College Field House…the atmosphere was nothing short of electric!…of course shooting off fireworks inside so close to the 4th of July happened, helped. That era of JA’s history and Grace Slick’s bold, yet velvet voice was something of an enigma! I was smitten right during that concert and loved their music ever since. $3 for a concert back then…WOW! Joe, I did not attend the concert but I was working downtown at Drekmeiers that Sunday afternoon. Into the drugstore came Grace Slick and two other men perhaps Paul Kantner. They ordered malts at the fountain and generally went through the store while the malts were being made. I remember it as they looked even freakier than the Beloit College students. Good to hear from you, Kevin. Great story! Thanks for sharing it. Best to you and yours.